The BIN and SYS folders need to be there for ESXDOS to work, the rest can be arranged as you like. The current ESXDOS firmware (0.8.6) is limited to 8.3 filenames, so rename files and folders where necessary. There is a Games folder with some sample games which were downloaded from sites like ‘World of Spectrum’. We have not been able to test all the games in this folder, let us know if you find better versions. Most of these games are over 30 years old and publically available on the internet, so it is really only the ebay sellers who would benefit, not the original copyright holders. If any of these infringe your copyright, we will remove them from future releases. Whenever you want to load something, press the menu button at the rear button on the divMMC Future. This is illuminated, and will flash during operation. When the menu appears, you can navigate through using the arrow keys, select the appropriate file and press enter to load the file. Press space to exit the menu without loading a file. Note you can load the menu and then return to BASIC without losing the current program. Online help is available by pressing the “H” key from the menu screen. The non-illuminated button on the divMMC Future is a reset button which will reset your Spectrum. Note because of this, the version of +3E ROMs which rely on disabling the firmware whilst retaining access to the SD card will not work with the divMMC Future. To install new firmware to the divMMC Future, load ESXMMC.TAP via SD or physical CASSETTE/TAPE-IN and EJECT SD Card from divMMC Future before commencing flash. NOTE: If you need a WAV version of the TAP file, you'll find it in our Lite-Combo pack. You can attach a standard Atari / Commodore style joystick which will appear as a Kempston compatible joystick to the Spectrum. Note Sinclair / Amstrad style joysticks are not supported due to their alternate pinout. In testing we have found some files available on the internet are more suitable for emulators and may not load correctly on real hardware. If you are having problems loading a particular title, you can load it in an emulator such as fuse, and save a .z80 screenshot once it is loaded (press F2 in fuse). These can then be loaded on your real Spectrum. 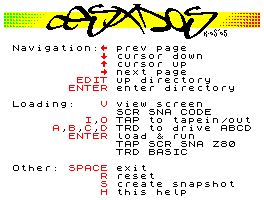 Within BASIC, a number of commands are available as an alternative to using the main menu. Your program will then be written out to the filename.tap file. If you want to change files or load back, you should use the following command the close the file. To load you program back in, select ‘filename.tap’ from the menu. If you already have a .tap file created, you can just scroll to the file and press ‘O’ to set it as the output file, and then return to BASIC to save the file as before. Thanks to Mario Pratzo, Miguel Guerreiro, and others for their work on the original divMMC designs and ESXDOS firmware, more info at esxdos.org. Thanks to Dave and Tim for their work in updating the divMMC design for the divMMC Future.